I look around the neighbouring countryside with the vines still slumbering - barely - and I cannot help but notice that spring is slower than usual to show her colours this year. Easter is early too. There is hope however. On opening the door into the garden there is movement everywhere of birds flying off. The place is full of excited blackbirds and thrushes. Last week I caught a glimpse of a blackbird's nest disclosing three soft blue eggs. Mademoiselle Easter honours these fragile beginnings. Pale pink and white blackthorn and cherry plum blossom with the beautiful greeny-blue of bird eggs concealed in many a hedge and tree. Mademoiselle Easter - who is on her way to California - and I would like to send you all many Easter blessings. Even if spring is being a little shy and the sun is playing hide and seek there is so much love to give and receive. And chocolate too, naturally! Next week I will be introducing you to a new creation inspired by my favourite city, Paris. Brace yourselves for she is neither hare nor rabbit! I have so much to share with you but I will tread quietly through the next few days. A lack of sunshine is playing with my energy levels; do you feel the same way too? Clasping the money in my hand I rang the bell of the little stone lodge and observed through ornate wrought-iron bars the sun-drenched seventeenth-century château and gardens slumbering peacefully. Straining my ears a little I exhaled with pleasure: the sweet sound of bird song was the perfect musical overture for our afternoon plans to wander around the grounds of La Chatonnière Château. After a few, long and pleasurable moments of anticipation I rang the bell again and recalling the unhurried pace of the concierge crossing the courtyard two springs ago I decided to amble off to meet her. My children and husband drawn by the exquisite beauty of our surroundings had already walked through the open entrance gates to explore the gardens which are suffused with the magic of childhood French fairytale authors; Charles Perrault and Marie-Catherine d'Aulnoy. The concierge greeted me with a warm, lazy smile and we chatted gently. "You only need to pay for two tickets not four", she assured me. "The flowers are only barely coming out, you see". And yet, just as the Spring Equinox is the calendar day most certain to raise our spirits, watching a garden unfurling in early spring gives as much pleasure as a summer garden in full swing; wouldn't you agree? The whole blessed and delirious flower pageant is still to come and I cannot help but agree in this case with Robert Louis Stevenson's wise words: 'it is better to travel in hope than to arrive'. Spring is dragging her heels this year it would seem but she was very much present at La Chatonnière on this sunny afternoon. The children were caught up in the magic and unbridled joy of discovering an Italian Renaissance inspired garden with its various levels. After clambering up a steep woodland path strewn with wild violets they observed the maze in which they had been playing below was in fact leaf-shaped. The particular spot which drew me back this spring is Le Jardin de la Danse: a tiny corner of paradise I first discovered in the presence of the great garden photographer, Eric Sander, whose book on La Chatonnière will be launched early April. Remembering my sadness this time last year I did not wish to miss out on the daffodils. Le Jardin de la Danse is dedicated to a very particular choreography dedicated to daffodils - le bal des narcisses - as it is poetically named here. It is breathtakingly beautiful. The blooms are staggeringly wonderful this season. As my eye jumps from whole flower to stamen, foreground and background, I wonder; are they daffodils or narcissi? All daffodils are narcissi, but not all narcissi are daffodils. Technically, they differ according to number of flowers per stem and length of trumpet. Daffodils are poisonous although I have never heard of anyone dying from a meal of daffodils. The sap contains sharp crystals of calcium oxalate, an irritant that also seems to bother other flowers, which wilt if they share a vase with daffodils. My mind wanders to Gaspard our dog who, as a very young puppy last year, diligently dug up our yellow tulip bulbs; foolish creature. I hope he has the sense to steer clear of our daffodils this spring. There has been a different kind of dancing taking place these past few nights mostly in the comfort of my armchair! A shawl has been made with a little simple lacework which I have named Sugared Primroses. A very special friend, Christina, is getting married in Bangor, Wales the weekend after Easter and I know she loves daffodils and the colour yellow almost as much as her future spouse! I knew which yarn I desired for this shawl; Juno Alice. I had great difficulties obtaining the perfect shade of buttery yellow Christina loves and ended up contacting directly the enchantress behind Juno Fibre Arts, Asti Grafham. She was wonderful and promptly shipped out two skeins of her magical Juno Alice in Corn Dolly which is like spun gold and reminds me of the fairytale character, Rumpelstiltskin, who was able to weave gold. This pattern, Sugared Violets, which I have had my eye on for quite a while now, only required one of those skeins. And why do I make the connection between knitting and dancing? The thought struck me during those late evenings of working through three hundred odd stitches that lace knitting is a strange form of choreography: a simple stitch sequence which is repeated a (large) number of times. As I worked religiously and, dare I say, a little tensely, through these sequences a wonderful thing happened. I found my fingers and needles began to dance in time with my quietly chanting mind like a couple learning to dance the waltz will repeat the steps under their collective breaths. It wasn't boring but quite beautiful. I will be sending this secret gift off this week with a kiss and a box full of good wishes for a very happy wedding and a future full of wonder. My notes, as usual, can be found on Ravelry. I will be back soon with some Easter delights to share with you. Thank you so much for being here. I wish you all a very happy week. ps Please forgive me if I have not been leaving many comments recently on your lovely blogs which I have been reading and enjoying. For some mysterious reason my computer fails to recognise my Google account address and password so I cannot log in to my account. Let us hope Mickaël finds a solution soon. Few things give me as much pleasure as the simple flowers of early spring: white blossom (cherry plum (Prunus cerasifera) in this case - am I right? - which is easily confused with sloe (Prunus spinosa) but generally flowers a month earlier than the latter) bursting forth on bare wood against a grey sky which holds the promise of blue. March has arrived with its temperamental weather and one gust of cruel wind will send these dainty petals into the air like a whirl of snowflakes. For the time being, however, these ephemeral flowers will remain clenched on twigs clothed with the rich bloom of age-old lichen overlooking the slow-moving waters of the river Loire. This year I wanted to capture those shining white flowers with their golden stamens and keep them close for a long while. Nothing soothes my winter-weary heart as much as a piece of beautiful frivolity or whimsy and so I purchased this head wreath for Angélique...just for fun! It's girly, holds the promise of spring, and sits so prettily on her head of loose curls. If you too are easily seduced by aesthetic frivolity take a peek at the sweet shop Sparkle & Posy. I think there may be the very same wreath gracing those alluring shop shelves! After the Mad March Hare and Easter Rabbit flurry I am planning to start a new series of creations in April. 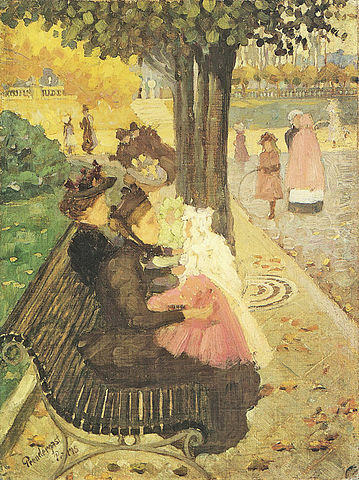 Of course I am keeping it secret for now but the work above by the artist Maurice Prendergast of The Tuileries Gardens, painted in 1895, will give you some sort of clue! My sweet son Tristan has been learning the art of patience. Finally for his ninth birthday in February I promised to make him his first pullover and asked him to choose both the pattern and the colourway. He was so thrilled that he performed a happy dance on the spot! Dear child. He opted for a simple knit called Tea With Jam And Bread which I had first caught sight of on Itty Bitty's inspirational knitting blog back in October and which lends itself to playing with colours a little. Tristan's choice of Duck Egg blue, yellow, and cream sing out Tristan to me and, dare I say, spring too. Tempted though I was for a short while to name this pullover 'Lego' - don't those stripes remind you of Lego blocks piled up high? - my son has never liked Lego. I could have called it 'Cars With Music And Art' - his three favourite things but he urged me instead to find a spring name for his first pullover. We came up with 'Blue Sky, Clouds, and Daffodils'. My Ravelry notes can be found here. Like most knitters I have a list as long as my arm of patterns I would dearly like to try my hand at. As a contrast to Tristan's straightforward sweater my roving knitter's eye caught sight of the delightful picture below of a slightly more complex knit - 'Lobelia'. Generally speaking I rarely buy magazines. I do, however, think Pom Pom Quarterly, a small-scale, homegrown publication launched in autumn last year, deserves a shout. It is fairly pricey - you can see how much it costs on the front cover pictured below - but it boasts a handful of very lovely knitting and crochet patterns enhanced by a modern aesthetic and appealing writing. 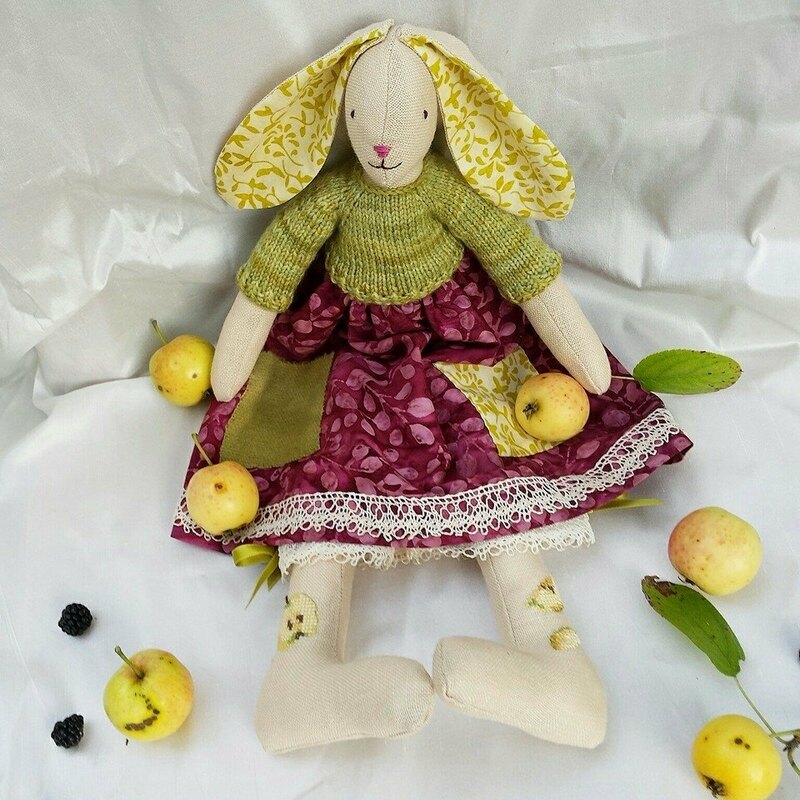 The fourth edition, entitled Verdant Stitcher, celebrates spring both in colour and subject matter. If you too have leafed through or bought Pom Pom I would be curious to read about your impression. Inspiration has also been found in Ashley English's recipe book: A Year Of Pies. Héloïse said to me today how each seasonal recipe looks more delectable than the last. She's absolutely right and however much I have been seduced by winter's feasts my fingers are itching to turn the page and move on to spring's recipes. The sweet tart pictured above has been inspired by Ashley English's Maple Orange Walnut Pie but I played around with the ingredients today and turned it into a Maple Syrup, Lemon Almond Tart instead. It reminds me of the delicious treacle tarts I used to eat as a child on sundays both in taste and texture with a slightly crunchy almond topping. Thank you so much for stopping by! I wish you all a beautiful and inspiring week. Spring is on its way!